How does a school that has no room for boredom look like? This question was answered by UNK project in their project (no pun intended) of the educational complex to be built in Yuzhno-Sakhalinsk, which got a name of “Neskuchnaya Shkola” (“Boredom-free School”). The idea of an educational complex, or, as it is fashionable to say nowadays, “cluster”, is not exactly groundbreaking. As early as in the Soviet times, there were “combined education facilities” that hosted kindergartens, nursery, junior, and senior high schools under one roof. Sometimes such facilities would also include professional education institutions, such as pedagogical colleges. Today, virtually every school offers extracurricular classes giving the children an opportunity for getting well-rounded education, and saving the parents extra time that they would have otherwise spent commuting their children to a separate place of after-school education. However, these specialized classes are usually conducted in the same standard classrooms that are used in the daytime, which lack the equipment and resources for professional education, and it is clear that this is a less-than-ideal situation. 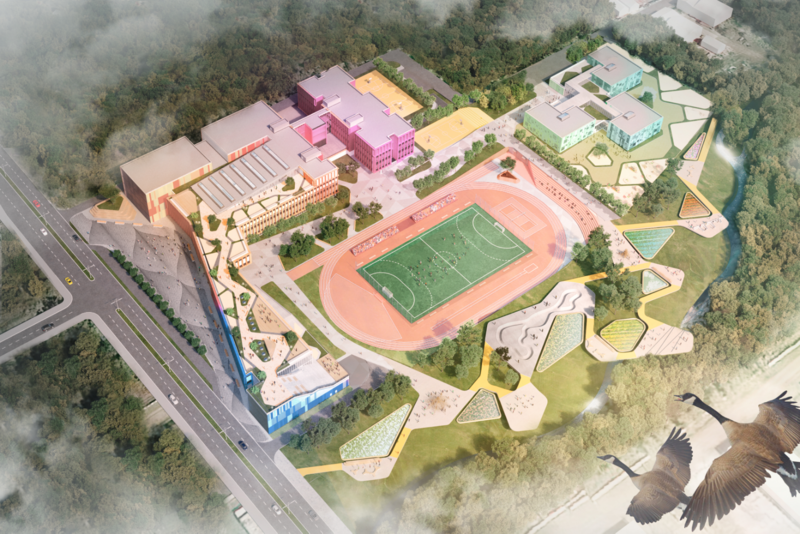 The educational complex that the architects of UNK project proposed for the Yuzhno-Sakhalinsk competition includes not only regular schools of various education degrees but also an art school. Such an approach is extremely relevant because it makes it possible to regard the modern school as a home where children spend most of the day and even most of the year. Another important aspect was the connection between the complex and the city – its people and environment. Setting the goal of the project as creating an open cultural space for the high school students and for the city people as well, the architects proposed a new vision of the modern educational process, realized through volumetric shapes. The concept won in the competition, and it is due to be soon implemented. For the architects, the work on the project began with analyzing a typical school and its architecture based on the classic model of a classroom system – a model system when the knowledge is passed on from a teacher to a student: the typical “boxes” of classrooms with a unified rigid structure of classrooms and corridors, which are oftentimes a thing in itself and are pretty easy to detect amidst the city panorama due to their prominent facelessness and the absence of any visual connection with their surroundings. Based on duplicating this model, the old educational system worked pretty well for a long time but it is clear that today it is no longer relevant. Still in the 1930’s, Johan Huizinga proclaimed that a game is indispensable part of culture. His Homo Ludens – the “playing man” – turned out to be the perfect model for the human being of the new age, while the game itself the perfect educational tool in the swiftly changing world. 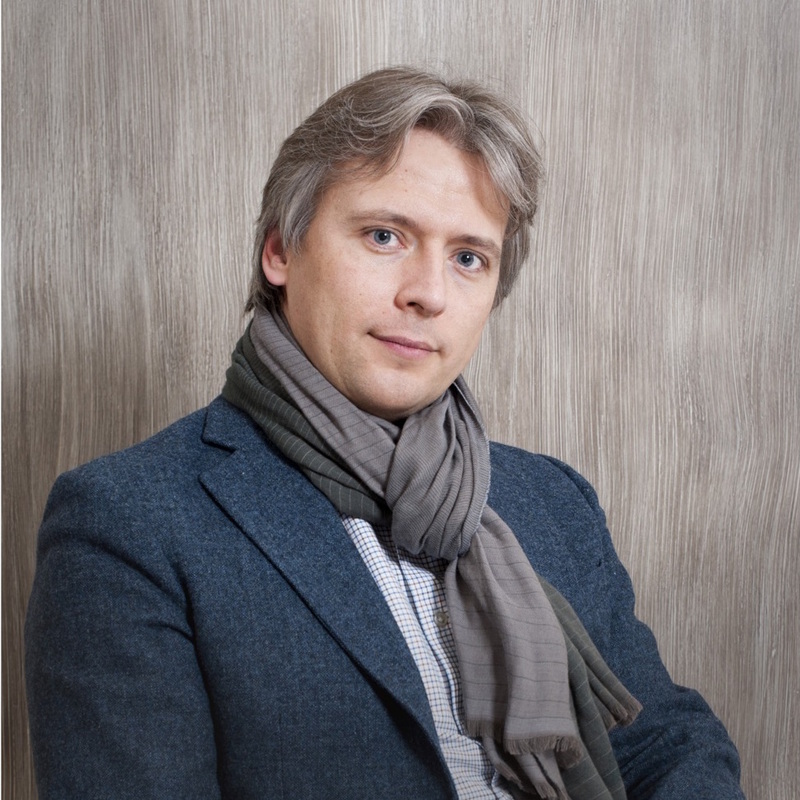 What is interesting is the fact that when they were developing their project, the architects proceeded not only from their own, although rather rich, expertise of designing schools – currently, the construction of the “Smart School” in Irkutsk is underway, built by the joint project of Denmark’s Cebra and UNK project – but also on their experience in working with IT clusters. 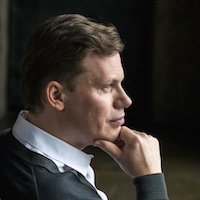 “In IT clusters, we create conditions, in which the adults can create, learn, grow, and, strange though it may sound, play – Yuliy Borisov says – The educational cluster is created specifically for those people who in the future will be in demand and have value. And in order to achieve that, you need to foster such qualities as creativity, sociability, and the ability for learning and self-development. 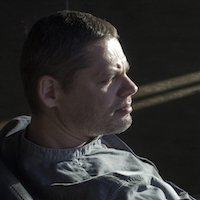 A game will give these people a chance for self-realization and self-expression. 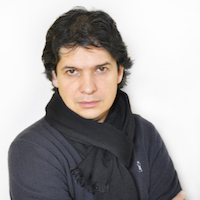 In addition, it is fun to play, and it will give you a chance to feel like a fighter and a winner”. 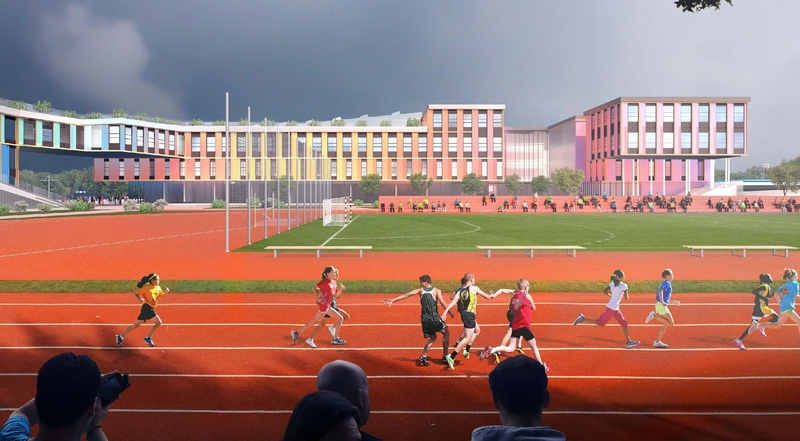 In the Yuzhno-Sakhalinsk project, the game begins as early on as at the stage of the visual image – the complex is turned to the city with the pair of buildings of the regular school and the art school that are also united by a segment of usable roof. Such composition allowed the architects to make a rather large sports nucleus on a very cramped land site – a task, which, by the way, turned out to be too much of a challenge for some of the contestants. The part of the territory that is the farthest from the street hosts a kindergarten. 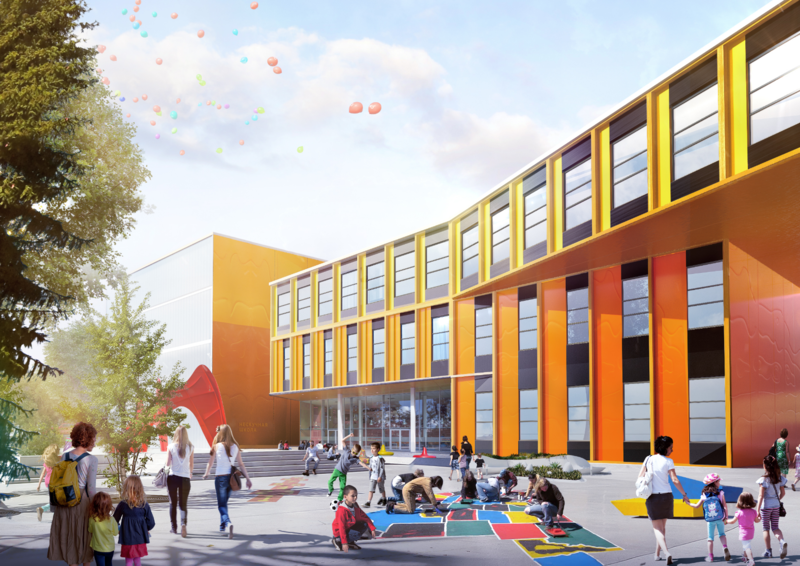 The image of a school that must become an event in its own right is formed thanks to a bright color design solution, each of the buildings getting a color of its own: the school building is orange, the school of fine arts is light blue, and the junior high is violet. The same color code is used in the interior design and navigation. 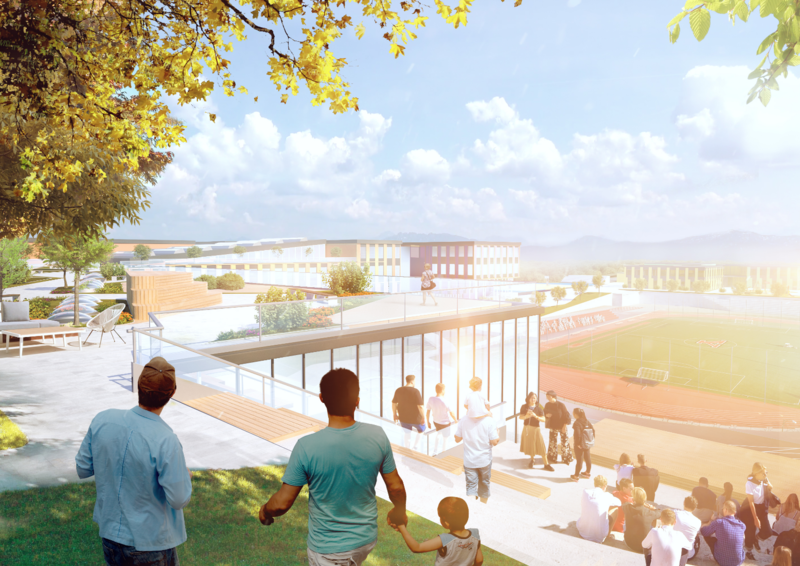 The sports nucleus, consisting of a football field, a few zones for track and field activities, a jogging track, spectator stalls, and rock climbing wall, becomes the key link that connects the school and city. Turned in the direction of the river and park, it can be used not only by the school but by the local residents as well. The park is a place that deserves special attention; it is not just a place for meditation but also for active recreation – it will include a skate park, as well as meditation and yoga zones. Giving up the conventional approach to design, the one that boils down to the formula “function / façades / economy of construction”, UNK project first of all paid attention to the processes linked to education – because children learn not only in class but during the entire time of staying within the school walls. Today, high-school education is regarded as a continuous process, one of important constituent parts of which is communication that takes place not only in class but also in the cafeteria, and in the recreation halls. The concept does not go as far as to propose to refrain from using classrooms altogether but it widens the range of educational possibilities: the architects provide mini-classrooms designed for one-on-one instruction, quick transformation of standard classrooms to fit different scenarios, and uniting several classrooms into large audiences for several classes. At the same time, the integrated educational environment is formed not only at the expense of different sizes of the auditoriums, but also the recreational areas. Variability and flexibility in this project are the basis for creative design thinking that is fostered by the very space of the school building. 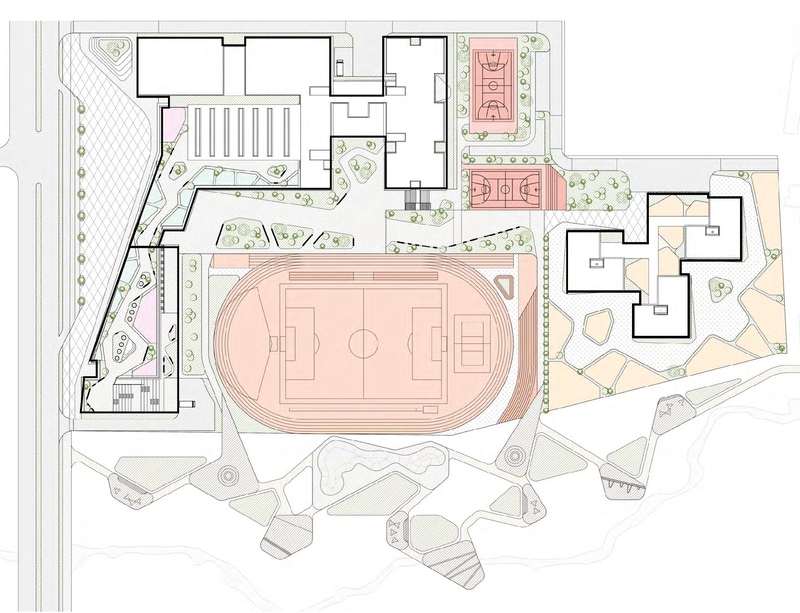 Analyzing a child’s day from the moment he or she arrives at school to the moment he or she leaves, the architects are proposing to look at it from the side. To a certain degree, the organization of the cluster realizes the metaphor of a city with residential areas, squares, green zones, and parks. When they were designing the entrance group, separated from the street by a square, the architects paid special attention to the beginning of the student’s day when he comes to school and changes before classes. This part of the building, very much like the school’s face, must be convenient for people or limited mobility, and capable of giving shelter from the wind and the rain. The lobby – which in most standard schools looks like a checkpoint of some top-secret research facility – is in this case open and double-height; standing in it, one can easily see various functional zones of the school. Another little detail that says a lot about the architects’ attention to children’s comfort: the lockers are color-coded and are different from class to class. 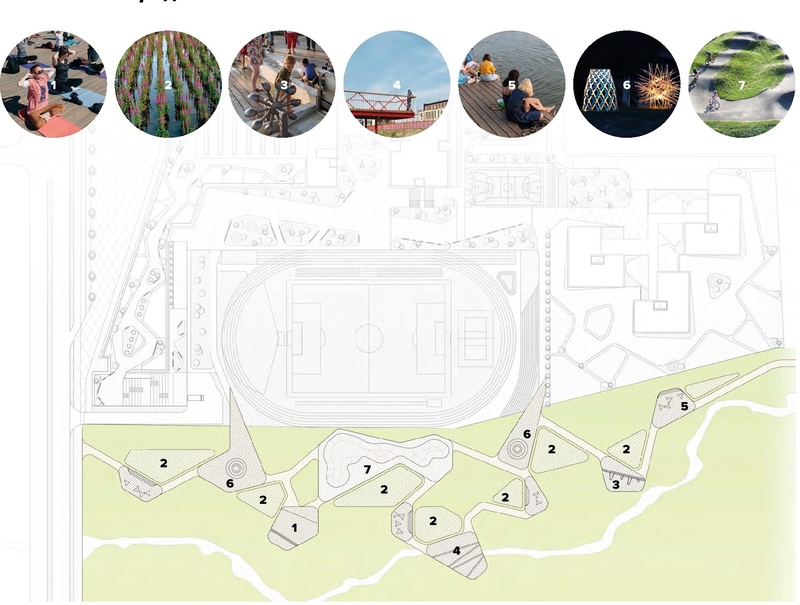 The interflowing student lounges are divided into subgroups – transition ones, lounges for quiet recreation, and lounges for playing games: the corridors are designed as landscaped city streets with recreational spaces made in the wall recessions, which eliminates monotony. 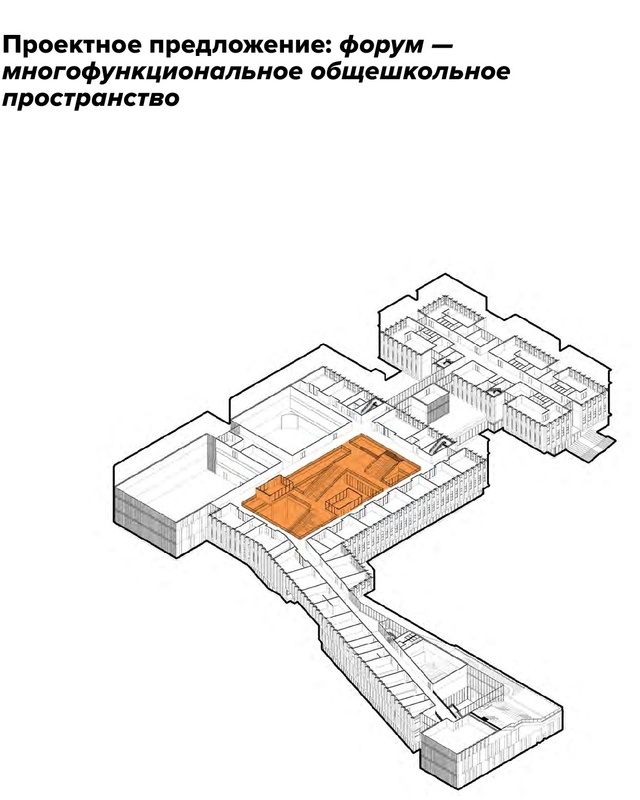 In addition, the problem of building too many corridors is solved by an atrium with a large staircase. It forms the central square – a place that will host meetings and events. 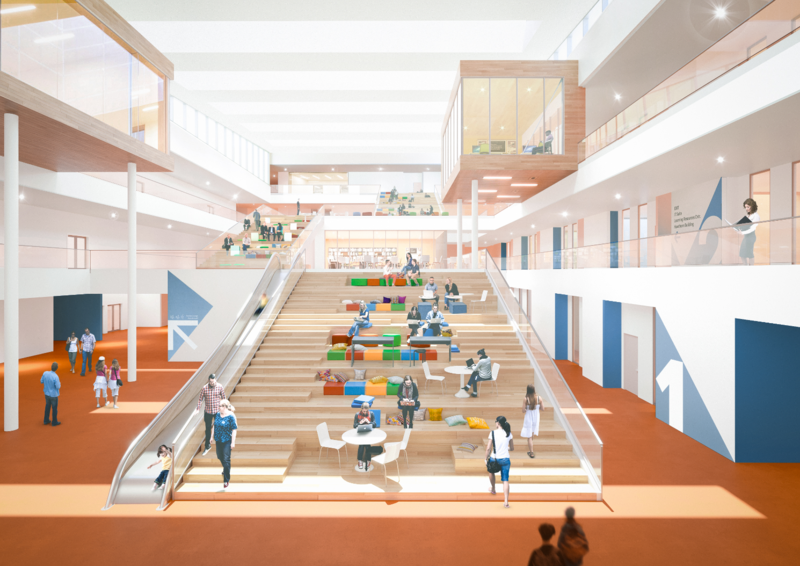 This space will increase the school’s transparency – the architects stress – but, above all, it must foster communication and interaction between students and teachers alike, as a forum of the school of a new type, in which communicative skills are regarded as crucial for achieving success in the future. The architects admit that in their desire for creating a place that a child would want to be, a place where he or she could study, play, learn and grow, and have fun, they borrowed a lot from the best practices of the Northern Europe, specifically, Denmark and Finland, where a school is regarded as a part of urban environment. Linking the art school to junior and senior high is one of the first steps toward this goal because it creates all the necessary conditions for fostering love for learning and self-educating. On the level of the third floor, the art school is linked to the high school, which allows the children to use both functions without having to go outside at any time of the year. At the same time, its “fifth façade” – the sloping roof – is also integrated with the city fabric. 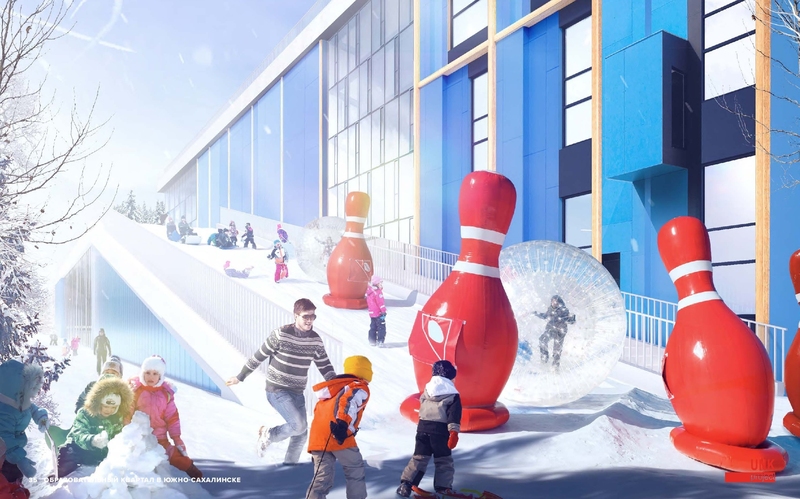 The architects propose different options for using this roof by students and city people alike: in winter, it might be a ski slope – Yuzhno-Sakhalinsk is not particularly known for steady snow coverage – and in summer it may become a movie theater, an educational vegetable garden, or even a model meteorological station. 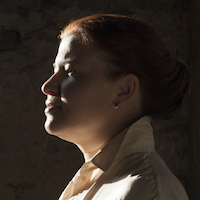 The roof commands beautiful mountain views, and, therefore, one of the functions of the roof, which is directly connected to the art school in particular, is that in summer it will become a platform for en plein air painting and art exhibitions. The kindergarten, which stands a little distance apart from the school complex, also has a usable roof. Its image was designed with a different audience in mind – the little ones – and that’s why it was engineered proportionally to its little inhabitants and in a playful style: windows of different sizes and multicolored façade panels immediately immerse you into the world of childhood. 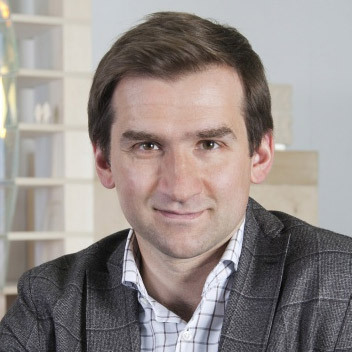 “This cluster has in it places for both sports and arts: the children themselves can choose what to do; this implies greater freedom, as a consequence, greater responsibility – Yuliy Borisov says – this is a very important aspect of forming one’s personality, and the city government showed a lot of enthusiasm and readiness to experiment in that direction. Essentially, the cluster becomes the community center where people can spend their free time, and this goes a long way to better people’s lives in the entire surrounding area, while the new functions that it offers breed healthy competition”. Unconventional ideas for school buildings, capable of transforming their space and composition and thus address the new trends in modern education – attention to communication, flexible processes, wide range of options, and freedom of choice – are as relevant today as never before. At a first glance, it seems that you just cannot implement within one and the same building such incorporeal values as psychology and pedagogy. But it turns out that you can, and the results end up being creative and diverse, gradually forming in our minds and in this country an image of a new progressive school that is essentially the place that children want to come to. Of course, the right building alone will not ensure the right and professional teachers capable of turning the teaching process into an exciting game that would be really fun to play. Anyway, people to buildings or buildings to people, any steps in the right direction are good, especially if they are consistent. This experiment looks particularly impressive if we take into account the very geographical location of the new school – this is virtually the edge of the world.